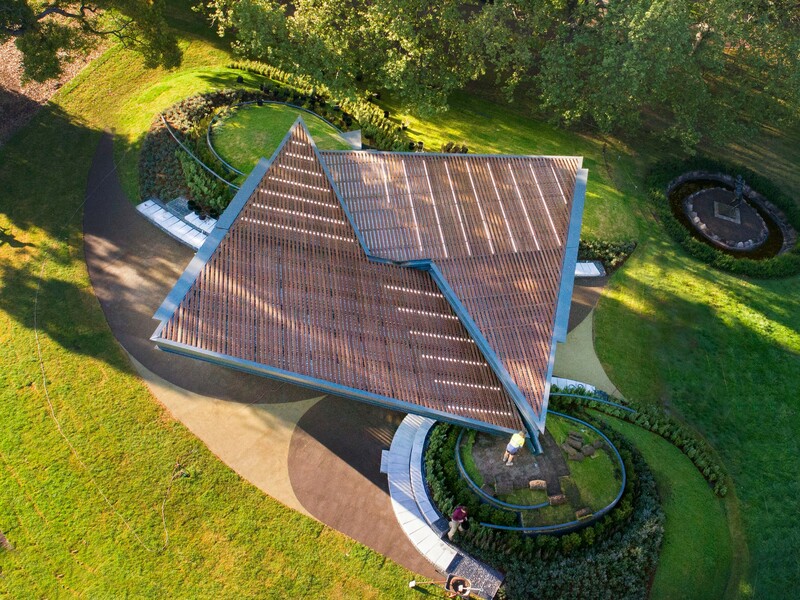 Exclusive drone footage shows off the MPavilion 2018, designed by Barcelona-based architect and educator Carme Pinós of Estudio Carme Pinós, which has opened in the Queen Victoria Gardens in Melbourne, Australia. 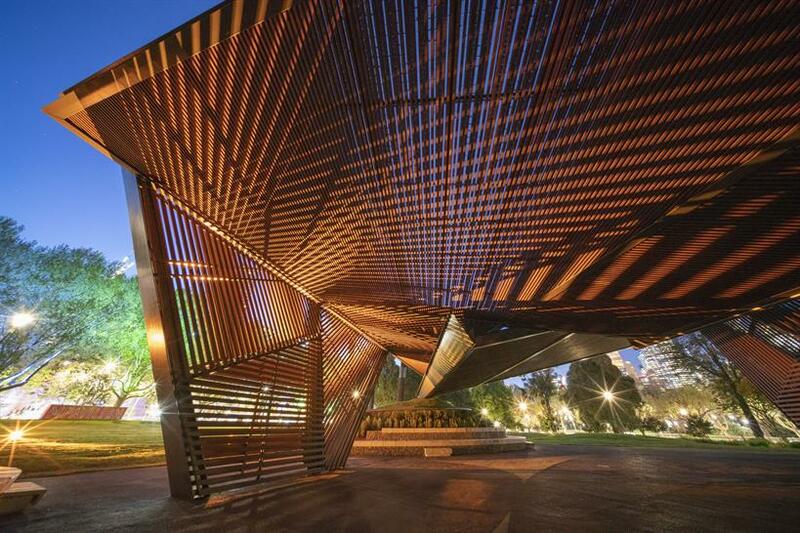 Internationally influential for her community-focused philosophy of design, Carme Pinós’s MPavilion marks the first public work in Australia by a female Spanish architect. 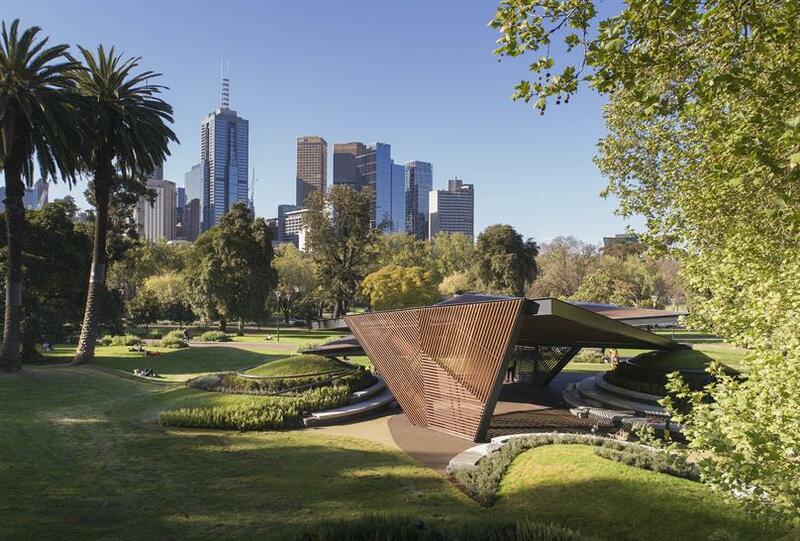 Initiated and commissioned by the Naomi Milgrom Foundation with support from the City of Melbourne, Victorian State Government through Creative Victoria and ANZ, MPavilion 2018 is the fifth in an ongoing series of annual architect-designed summer pavilions for Melbourne. 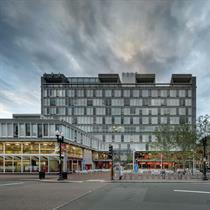 The pavilion this year celebrates building communities and women in leadership, and heralds a free four-month program of events from 9 October 2018 to 3 February 2019, featuring over 500 Australian and international guests and collaborators. 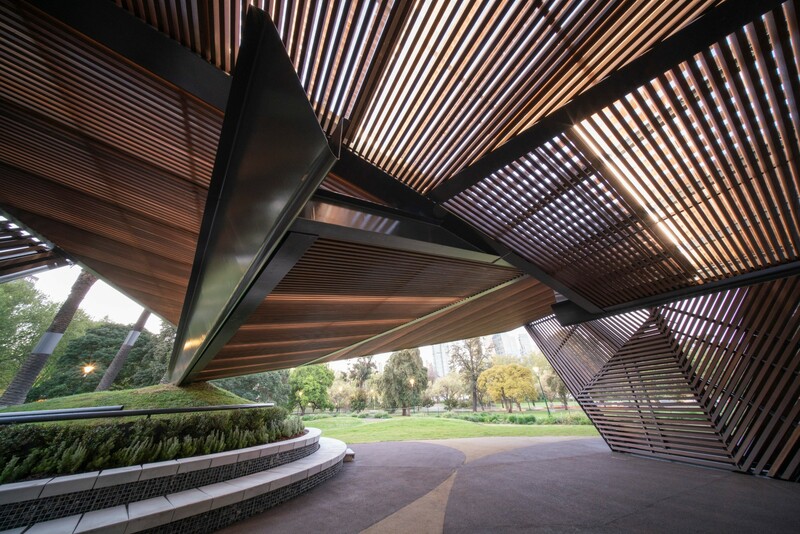 MPavilion 2018 was officially opened by MPavilion founder Naomi Milgrom AO, architect Carme Pinós of Estudio Carme Pinós and the City of Melbourne’s Councillor Rohan Leppert. The opening event was commemorated with a live performance from Yorta Yorta soprano Deborah Cheetham AO and Dhungala Children’s Choir. In true Pinós form, the sculptural design incorporates majestic wings inspired by origami that, rather than make a heroic statement, open the MPavilion to the city, encouraging movement, meetings and new experiences. The geometric configuration assembled in two distinct halves intersect with each other to form the pavilion’s roof. An altered topography forms three mounds that incorporate seating, allowing a multitude of community-focused activities to ‘unfold’ during the MPavilion 2018/19 season of events. Designed for MPavilion and to celebrate the opening, Carme has also released a special commissioned stool made in Spain by hand-tinted birch plywood. Carme Pinós opens the MPavilion 2018 program on Tuesday 9 October, speaking at The land on which we stand, presented by Melbourne Festival. 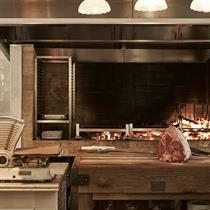 Carme will that evening also give an opening lecture at the University of Melbourne’s Melbourne School of Design, and will further speak at opening week events at MPavilion, including an in-conversation with Parlour on Wednesday 10 October and a discussion with Naomi Milgrom AO and ABC journalist Virginia Trioli on Thursday 11 October. The MPavilion 2018 program features hundreds of free public events through MTalks, MMeets, MMusic, MKids and MProjects event series, as well as MPavilion’s own curated MRelay series of tag-team talks, which this year focus on fostering inclusive and equitable cities. 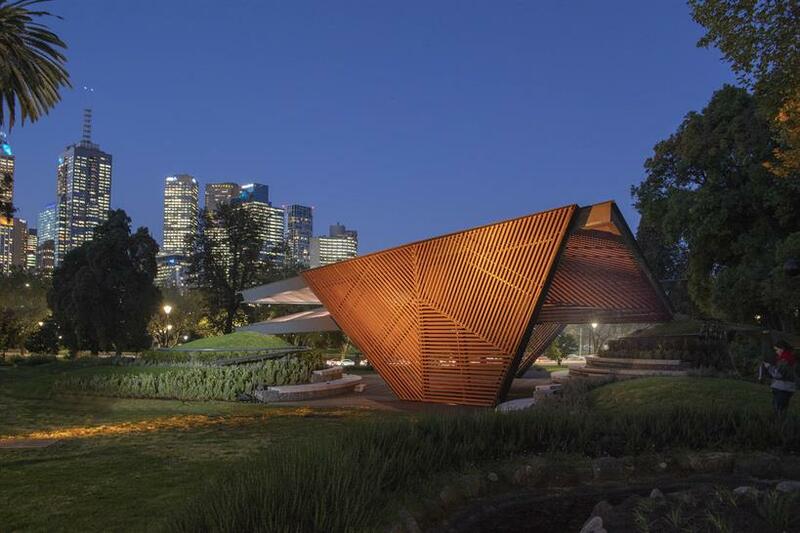 This year, MPavilion has greatly expanded its Indigenous architecture forum series BLAKitecture, initiated in 2017 and curated by MPavilion’s program consultant Sarah Lynn Rees. The program also offers MPavilion’s largest ever number of events developed in direct engagement with the public, resulting via an open call-out for expressions of interest in July. New in 2018 is MPavilion’s Writer in Residence program, which welcomes recipient Maddee Clark, a Yugambeh writer, editor and curator who will investigate the intersections between architecture and the written word. MPavilion’s 2018 Artist in Residence is award-winning Melbourne artist Esther Stewart, who will create an interactive installation at MPavilion to be enjoyed over summer. 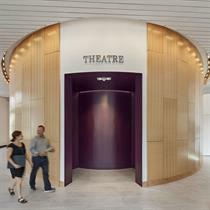 Esther has also designed and produced a bespoke uniform for the MPavilion kiosk. 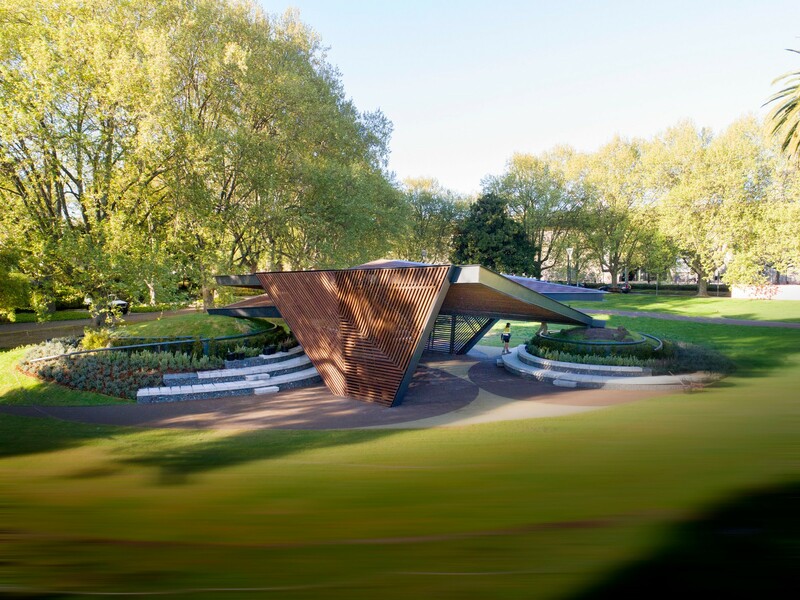 Further collaborators to the MPavilion 2018 program include celebrated London’s former director of Tate museums Sir Nicholas Serota CH, UK design sensations Fixperts, NY’s Hyphen Labs, Bakehouse Studios, Melbourne Theatre Company, Science Gallery Melbourne, Chunky Move, Melbourne Music Week, Multicultural Arts Victoria, RMIT University, SensiLab at Monash University, Heide Museum of Contemporary Art, Westside Circus, Liquid Architecture, Melbourne Recital Centre, and more, with new additions to the season to come. MPavilion is supported by principal partners City of Melbourne, the Victorian State Government through Creative Victoria, and ANZ. 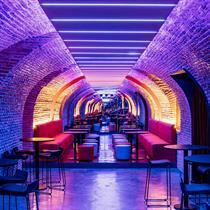 It was brought to fruition by Estudio Carme Pinós with the support of Melbourne based architects Zilka Studios; builders Kane Constructions and ACE Contractors; building surveyors Gardner Group, and landscape architects Tract, who won at the 2018 VIC Landscape Architecture Awards for their work on MPavilion 2017; lighting designer Ben Cobham of bluebottle; along with Studio Ongarato, Coleby Consulting, Otway Precast and Britton Timbers International. Open every day from 9am to 4pm through MPavilion’s season is the onsite licensed Kiosk, which features locally sourced food and beverages, including wines from Shadowfax, Four Pillars gin, Two Birds Brewing boutique beers—Australia’s first female owned brewing company, and Three Thousand Thieves coffee.